Okay, so this has actually been available for a few months but I haven’t gotten around to publicising it. 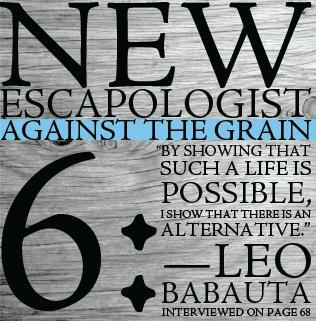 This is my favourite edition of New Escapologist yet. It has some hilarious features – my favourite two are about unorthodox funeral practises and why men should always sit to pee. I read it on a train and couldn’t stop myself laughing! It also has a great feature about urban nature writer Leonard Dubkin by Reggie Chamberlain-King. Issue six also features a piece I wrote called ‘I, Freeter“. It’s about a subculture in Japan which embraces freedom from full-time employment and emphasises creativity as a response to wage slavery. I spoke with the up-and-coming J-Rock band Atelieddy (previously known as Eddy) about the Freeter lifestyle and the philosophy behind it.